Jun. 23, 2011 Tags: Sarita's Word. I read this article and wanted to share it with you: Six ideas to encourage summer reading https://blog.sonlight.com/six-ideas-to-encourage-summer-reading.html. 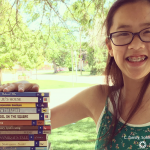 I've heard many stories like this one about children who use Sonlight and now LOVE to read. As part of the full curriculum, the remarkable Readers and Read-Alouds in each Core have helped them catch the reading bug. When summer break (or another vacation) comes around, you couldn't stop these kids from reading if you wanted to. I love that. This may sound obvious, but summer is a perfect time to keep plugging away with reading. Even if you take a well-deserved break from other studies, most children benefit from continuing to read every day. This could mean sharing a Read-Aloud together at bedtime, having your children read to you, or setting aside 20 minutes a day for everyone to grab a book and read silently. Especially for children struggling to read, this steady little bit of work each day can pave the way for a reading breakthrough. It also keeps your kids from losing whatever reading confidence they've built up over the school year. One of the fun tips I've seen pop up more and more is the idea of inviting children to read to dogs. Several different studies show that reading out loud to dogs can help kids gain confidence and fluency in reading. A quick Google search will turn up interesting studies and various library programs around the country. Sometimes called a "Reading to Rover" program, libraries often host specially trained therapy dogs to cuddle and "listen" to children reading out loud to them one on one. It seems that kids love the fact that the dog won't judge them, won't correct them, and listens with endless patience. Plus, these pets tend to calm children who would otherwise be nervous about reading out loud. So if you have a cooperative dog at home (or at Grandma's house, a neighbor's place, or the library), consider encouraging your children to read one-on-one to their furry audience. Who knows? Both the dog and the child might love it. Sometimes, we eager mothers want our children to push themselves all the time. But when you're helping children fall in love with reading, that may not be the best strategy. It's often better to let them read books that might seem too easy for them. You want great stories to drawyour children in so they're compelled to keep going. But when kids are frustrated because they struggle with each page of a book, they will probably miss the joy of the story. They may decide that reading is an unwelcome, unrewarding chore. But if children are allowed to read exciting books a bit below their ability, they will slowly gain confidence and (we trust!) eventually catch the reading bug. When that happens, they'll probably shoot ahead and start choosing harder books. I've heard of second-graders who would always pick picture books for their pleasure reading, until they suddenly found the joy of reading and took off into chapter books. Better to lay a foundation for the love of reading before pushing too far ahead. Summer road trips are the perfect opportunity to catch some great books on CD. Just head to your library and check out some audio books before you take off. When John and I would take the kids on car trips, I used to get books on tape from the library and a small tape player for each child. The only thing we'd hear from the kids for hours on end was, "Can you pass me another book?" I must say, it's a nice way to promote reading … and some peace and quiet in the back seat. Whether or not your kids are already hooked on reading, they might enjoy a local reading program. 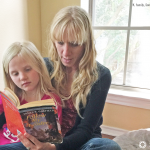 With fun events and prizes, these programs can have great influence in getting kids to read. If your local library or book store doesn't host a program, consider creating your own. A simple sticker chart with some basic prizes (such as an ice cream cone or a special date with mom or dad) could be all that you need for some serious reading fun this summer. Don't forget to pick out some great books for yourself, too. When your children see you enjoy reading on your own, it helps them realize that reading is a worthwhile activity. So don't feel guilty for heading out to the porch with a good book this summer. It may actually help your children! If you're wondering what to read during your break, take a look at any Sonlight Readers or Read-Alouds you may have skipped this year. Or get a head start on a few for next year. If you have access to the Sonlight Forums, head on over for some great summer reading suggestions. You could also start your kids on a book from a series. A series can keep them busy for a while, and helps them read with discernment as they learn to skim the information that is repeated in each book. Do you have other ideas to encourage reading this summer? There are so many summer reading programs out there with incentives. Barnes and Noble, Borders, as well as many local libraries offer free books and other "prizes" when children read a certain number of books. A great way to encourage something many homeschooled kids do naturally - read! We've used several of these ideas, mainly letting them read below their reading level if it just gets them reading, and trust that the joy will come. And with my 2 readers, it has! One was even a "late" reader and now reads avidly, above grade level, and we've begun the chant of "No books at the dinner table...." because he just can't put a book down. I keep our previous SL Cores on the shelves, and books that were read-alouds years ago are now readers for him, and he's enjoying them so much more. This is why I'm not stressed over my youngest not yet reading -- he'll get there. Of course, the most unorthodox thing we did with our struggling reader (the one who's now quite an avid reader) was to use subtitles when we watched movies, and let him play video games that had written cues on screen. He had to read the cues to know what to do next, and it helped. We also encouraged comic strips with high vocabulary in small amounts (Calvin & Hobbes). Unconventional, but sure did work! Now he's usually reading 3 books at once and flying through things well above his grade level.